What’s the safest, cheapest DIY teeth whitening? Kamrin – Before we answer your question, we want to ensure you understand: The safest way to brighten your teeth is under a dentist’s supervision. If you do it yourself, the results are unpredictable. It is possible to get limited results with inexpensive teeth whitening. But don’t expect a super-white smile. The ingredient to look for in effective whitening gel is carbamide peroxide. If you have sensitive teeth, find gel with a lower percentage of the ingredient. Over-the-counter whitening strips – They can be effective. Check for the amount of carbamide peroxide in the strips. The higher the percentage, the more powerful the strips. But the more powerful strips may cause sensitivity in your teeth. If you experience sensitivity, take a break from the gel for a few weeks before using it again. You can also consider using strips with a lower percentage of carbamide peroxide. You may have to use whitening strips longer than two weeks to get the best results. Wait at least two weeks before using a new box of strips for another round of whitening. It will allow time for the color of your teeth to stabilize. Discounted whitening from a dentist – There are some dentists that offer discounted teeth whitening to their existing patients who keep their dental cleaning and exam appointments. You may have to establish yourself as a regular patient before receiving the whitening treatment. Some dentists who don’t offer discounts provide a payment plan for the treatment. Free or online kits – Avoid online kits that are advertised as free. These often are ineffective, damage your teeth, or have very high shipping fees. It is difficult to verify the active ingredient in free bleaching gel, so it’s best to stay away from it. Before you begin whitening your teeth, ensure that they are free of decay and your gums are free of disease. If your oral health isn’t good, the whitening gel can cause irritation. Dentists look for the causes of stains in your teeth to determine if they should be bleached. If you decide to use bleaching gel that comes in tubes, only use it with customized trays. 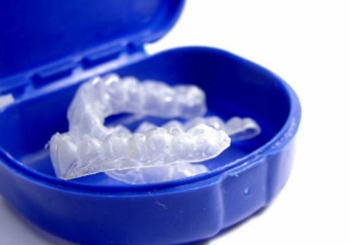 The trays keep the gel in contact with your teeth and away from your gums.